Mongolia was on our hit list for many years. Just the name Mongolia conjures up images of remoteness, empty landscapes and rosy-cheeked locals. It is also one of the few places left on Earth where you can travel for hours and see no sign of man’s influence on the landscape. Mongolia is also famous for its hospitable locals. As a traveller you dream of turning up in a strange town or village and being invited in by friendly local people. 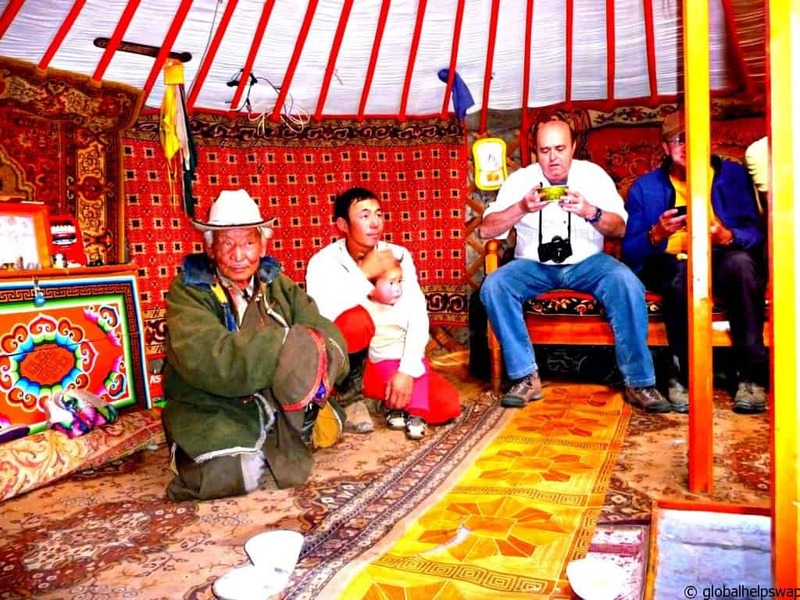 Mongolians do that naturally as many of them are still nomadic so they identify with travellers be they local or foreign. 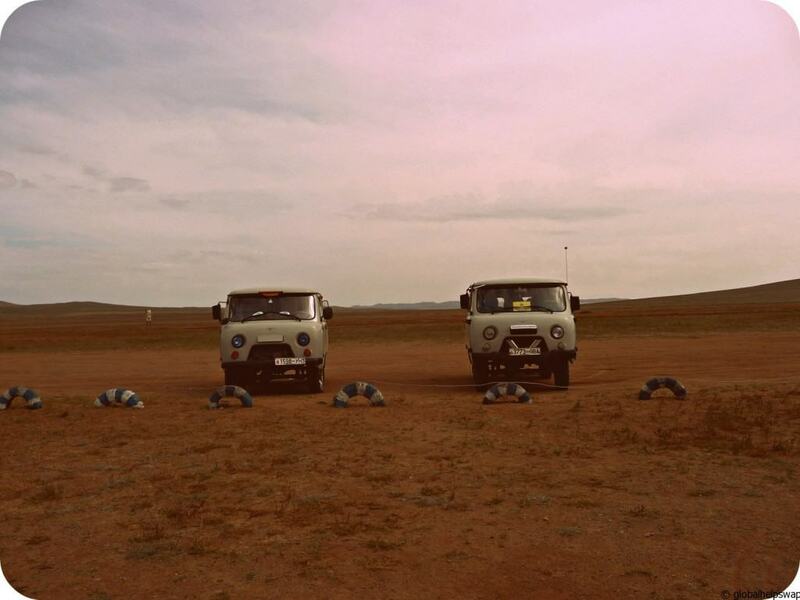 To travel around Mongolia you need a driver and guide/interpreter. The reason being is that once you are out on the steppes there are no roads. (Although some were being built when we were there.) Most of the guest houses in the capital Ulaanbaatar organise various trips around the country. 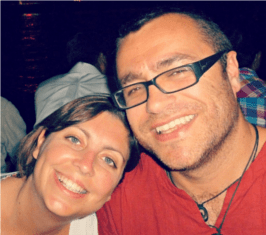 To keep costs low (as we did) you can share the trip with fellow travellers. We were in a group of 7 which we found to be just the right amount of people. There are two types of trips. One where you stay in tourist camps and another one where you stay with host families. We chose the latter as it’s a more authentic experience. Travelling around Mongolia is not easy! The drives are long (our first one was 11 hours), bumpy and hot. We travelled in an old Russian minivan which was perfect for the driving conditions but not the most comfortable of vehicles. Even though the drives are long, you get to stop many times between destinations. On our very first day we stopped to visit a family ger where they offered us fermented mare’s milk! Yum. I did not mind it at all but Karen hated it and discreetly passed it on to a fellow traveller before he was given his. It was great just to be sitting with this family in their home. The stop was not planned at all. Our driver just pulled up and in we went. No money was exchanged and it would not have been accepted. It was our first glimpse of the famous Mongolian hospitality. Apart from stopping to meet the nomadic locals we also stopped frequently to take in the scenery. And WHAT scenery. They call Mongolia the land of blue skies and it’s not hard to see why. You never need to look up to see the sky, it’s right there in front of you. Mongolia is famous for its dinosaur fossils. 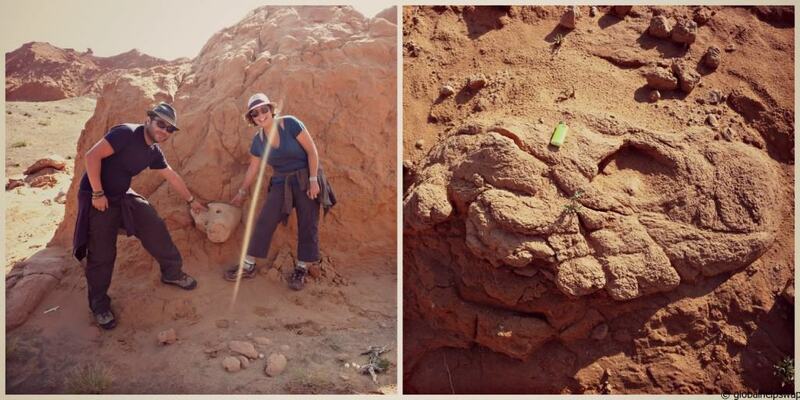 On our third day out we visited the Bayanzag Cliffs in which many dinosaur bones were discovered. They even found 2 perfectly preserved skeletons of two dinosaurs killed in mid fight over here – how brilliant is that?! We hunted around for fossils ourselves and we were convinced we’d found a few – take a look at our pictures and see what you think! 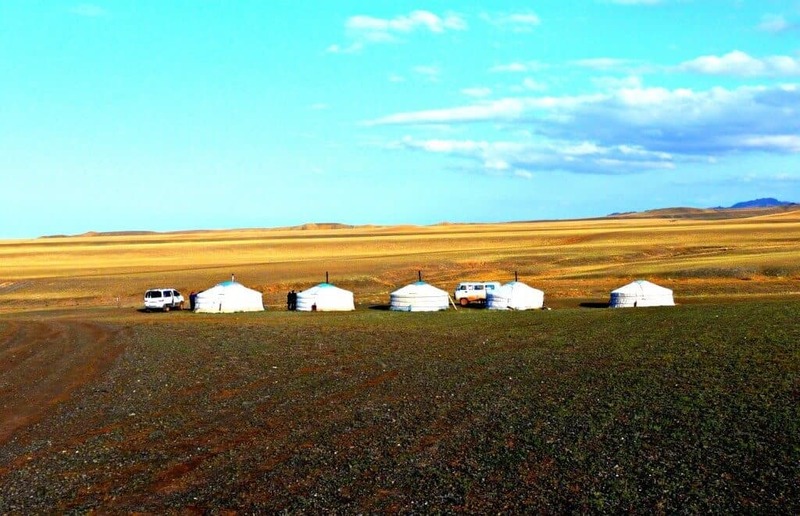 Most Mongolians sleep in gers which are similar to Russian yurts. It was one of the things I was most looking forward to. It felt so cool to be in one. As there is no tv, or any kind of distraction for that matter you are forced to sit and interact with each-other. It was brilliant. A ger is a social building but with a difference. It can be dismantled, packed and be moved within hours! I prefer them to a caravan. It took us 4 days to reach the Gobi sand dunes. I could write another 3 posts on all the sights and interactions we had before reaching the desert. From ruined buddhist monasteries to hikes in canyons. Terrible lunches in small towns and driving around herds of wild camel, goats and horses. 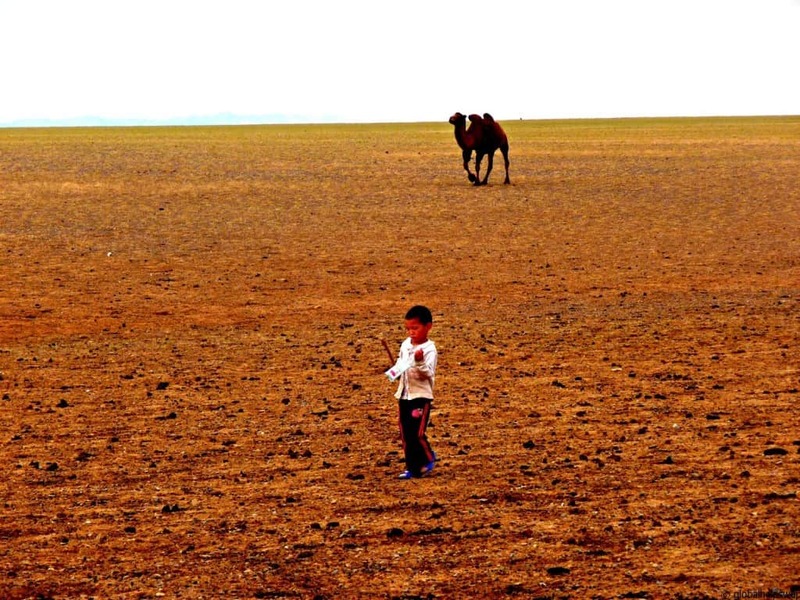 The Mongolian steppe maybe empty of people but it certainly is not empty of adventure! 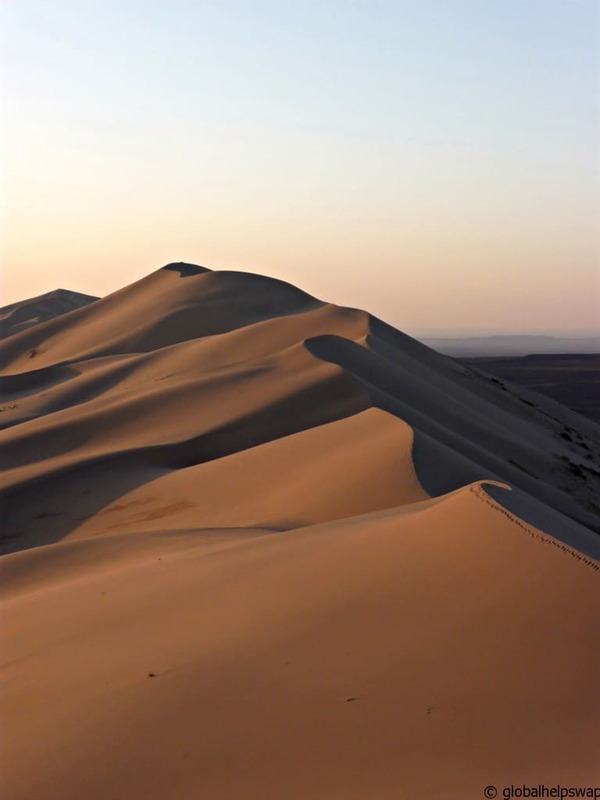 The Gobi desert sand dunes only cover 4% of the Gobi desert. The landscape changes dramatically which really surprised me. Far from being a barren sandy desert the Gobi is very colourful. There are lots of shrubs, bushes and even some trees, making it possible for all the animals to survive. Our ger was right next to the biggest dunes. At night we would all lie on our backs and look up at the milky way. You could actually see the white of the galaxy as there is no light pollution in the Gobi. 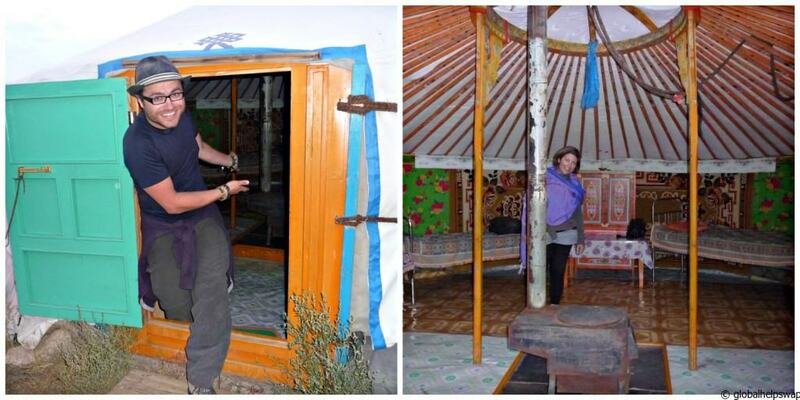 One of the most magical moments of our travels happened in the Gobi. One afternoon we climbed the sand dunes to watch sunset. It was such a special moment, we were surrounded by complete silence and wherever we looked we saw these beautiful dunes coming to life, exploding with the orange and red colours of the setting sun. A truly moving sight. Girls, traveling to the Gobi is hard work. VERY hard work. No loos, no showers, no electricity, hard beds, no pillows, no privacy, no comforts whatsoever. And yet, after a couple of days all these things paled into insignificance when compared to the natural beauty surrounding us and the adventure we were all having. We saw more horses than human beings, hordes of camels, sheep and goats but only a handful of vehicles. The sky was a magical blue and stretched out for miles on end. Being in such proximity to a bunch of strangers quickly forces you to build ties that usually take weeks, if not months to form. So don’t be put off by the hardship, it is truly worth it. 1) Book a tour within Ulaanbaatar. Most guest-houses organise tours and are cheaper than foreign booking sites. 2) Try and meet the people you are going on the tour with before leaving Ulaanbaatar to see if you are compatible. 3) Take some sauces, condiments, food with you as the food can be VERY bland. 4) Take warm clothes with you even in summer. We were there in September and one night it snowed. 5) Take a head torch with you as there is no light at night. 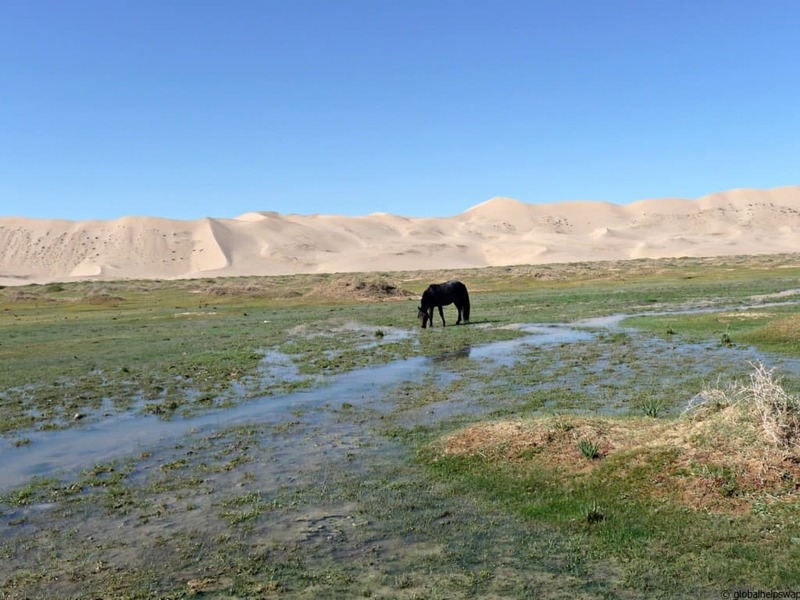 Magnificent Mongolia – Read about the 2nd leg of our journey from the Gobi desert to Ogii Lake. Pick up travel tips on Mongolia. Culinary Delights: Mongolia’s mighty food – Read why we think you need a strong stomach to handle Mongolian food. 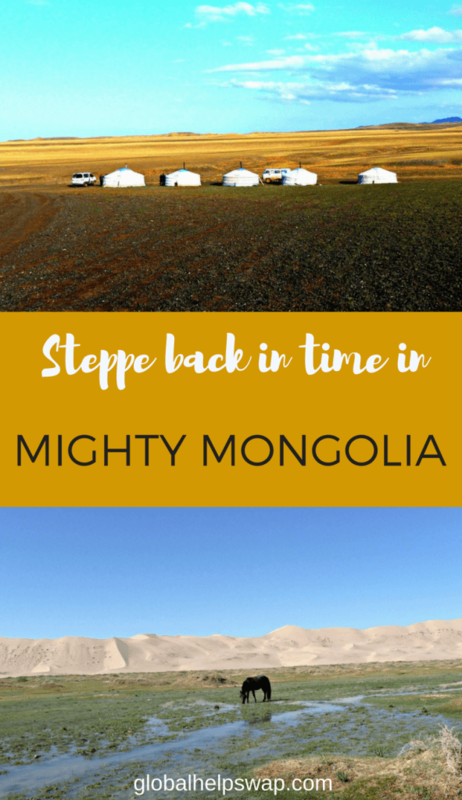 Memories of early travels | Mongolian Steppes Vlog – Watch our short Mongolian Steppes Vlog to get a quick snapshot of the stunning scenery that this wonderful country has to offer. It truly is the land of the blue sky. 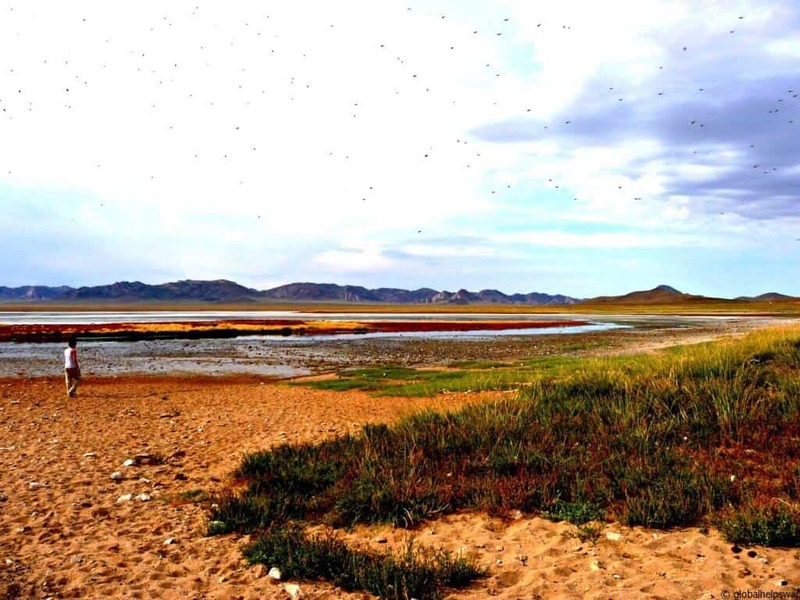 The Lens: Gorkhi Terelj National Park, Mongolia – The Lens: 3 images that capture what it is like to visit Gorkhi Terelj National Park in Mongolia. From getting drunk with locals to capturing the stunning scenery. Excellent! We actually met up with the rally when we were in Mongolia. Have a great time, it’s an amazing place. 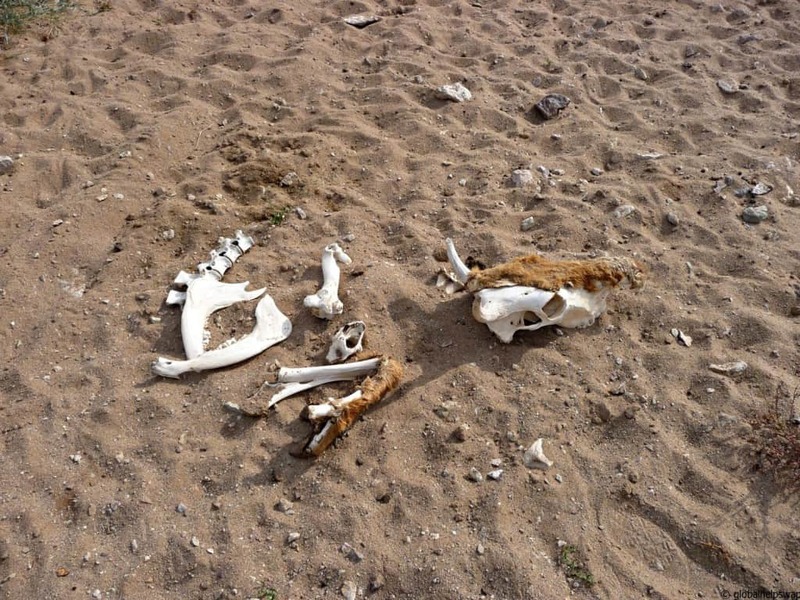 Keep an eye out for a couple of more blogs coming up on Mongolia too! Mongolia has been on my list for years and I think it should become a reality very soon. 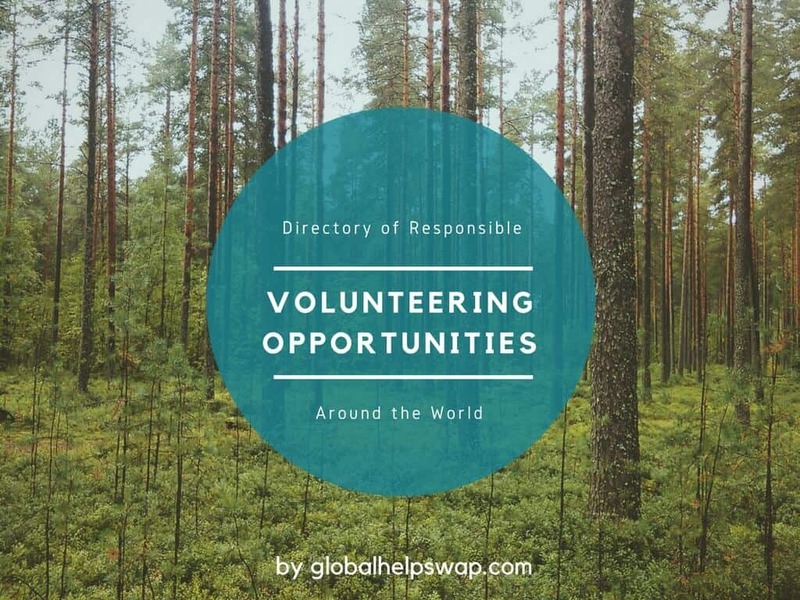 Would you be able to recommend any tour people or companies? Many thanks and keep sharing your travel experiences. Amazing photos makes me want to spend some time in Mongolia when we are passing that way. Thanks for the comment. Each guesthouse organises the tours and most are the same. However, some other travellers really raved about Golden Gobi so maybe check them out.